An Israeli bomb destroyed a U.N. observer post on the border in southern Lebanon Tuesday, killing two peacekeepers with two others feared dead under the rubble. 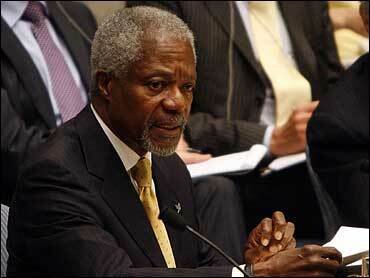 U.N. chief Kofi Annan said Israel appeared to have struck the site deliberately. Israel's U.N. Ambassador Dan Gillerman expressed his "deep regret" for the deaths and denied Israel hit the post intentionally. "I am shocked and deeply distressed by the hasty statement of the secretary-general, insinuating that Israel has deliberately targeted the U.N. post," he said, calling the assertions "premature and erroneous." The bomb made a direct hit on the building and shelter of the observer post in the town of Khiyam near the eastern end of the border with Israel, said Milos Struger, spokesman for the U.N. peacekeeping force in Lebanon known as UNIFIL. Rescue workers were trying to clear the rubble, but Israeli firing "continued even during the rescue operation," said Struger. The victims included observers from Austria, a Canada, China and Finland, U.N. and Lebanese military officials said, speaking on condition of anonymity because they were not authorized to release the information to the media. The body of Chinese U.N. observer Du Zhaoyu was recovered and identified, China's official Xinhua News Agency reported Wednesday, citing unnamed sources within UNIFIL. It was not immediately known which of the others was confirmed dead. As reports of the attack emerged, Annan rushed out of a hotel in Rome following a dinner with U.S. Secretary of State Condoleezza Rice and Lebanese Prime Minister Fuad Saniora. "I am shocked and deeply distressed by the apparently deliberate targeting by Israeli Defence Forces of a U.N. Observer post in southern Lebanon," Annan said in a statement later. Annan said in his statement that the post had been there for a long time and was marked clearly, and was hit despite assurances from Prime Minister Ehud Olmert that U.N. positions would not be attacked. "I call on the government of Israel to conduct a full investigation into this very disturbing incident and demand that any further attack on U.N. positions and personnel must stop," Annan said in the statement. Gillerman said "Israel is carrying out a thorough inquiry into this tragic incident and will inform the U.N. of its results as soon as possible." In the meantime, the envoy assured that "Israel remains committed to protecting the safety and security of U.N. personnel on the ground and is doing its utmost to guarantee that they be able to carry out their mission." "U.N. blue helmets are in the crossfire and the deaths today are an indication of how difficult it will be to have an international military force on the border between Israel and Lebanon, whether it is a NATO force or a U.N. peacekeeping force," says CBS News foreign affairs analyst Pamela Falk. "It is not the first time that U.N. forces have been hit by Israeli fire, intentional or not." Secretary of State Condoleezza Rice and other key Mideast players gathered in Rome for a meeting Wednesday to discuss proposals for ending the fighting that has claimed more than 400 lives. Key issues were how to disarm Hezbollah and assemble an international peacekeeping force to enforce the peace along the Israel-Lebanon frontier. "The major obstacle at the Rome conference, and for Secretary of State Condoleezza Rice's shuttle diplomacy, will be to create conditions that will convince all sides that a ceasefire is viable," said Falk, "and that will require a military force capable of ensuring a lasting peace." Israeli commanders said they would not push deep into Lebanon but were determined to stop Hezbollah missiles that have continued despite Israel's punishing raids on Hezbollah targets. Brig. Gen. Gal Hirsh told CBS News chief foreign correspondent Lara Logan that he didn't feel any political pressure to stop anytime soon. "We have plenty of time, and I intend to use it. As long as it takes," he said. A new volley of Hezbollah rockets hit northern Israel, killing a teenage girl, and Hezbollah's leader, Sheik Hassan Nasrallah, issued a taped television message saying guerrillas would now start firing rockets deeper into Israel. In that month, the crisis has spiraled far beyond anyone's imagining. Democrats in Congress are upset about the joint meeting set for Wednesday for Iraqi Prime Minister Nouri al-Maliki, demanding that he first make clear that he condemns Hezbollah for its attacks on Israel, instead of just criticizing Israel for its attacks in Gaza and Lebanon, reports CBS News Capitol hill correspondent Bob Fuss. Israel and the United States say their ultimate aim is to fundamentally reshape Lebanon to end Hezbollah's presence by the border, strengthen democracy in the country and ensure lasting peace with Israel. In the process, Lebanon has been ravaged, with hundreds killed, nearly a half-million driven from their homes and vast damage to roads and bridges. Cowan described the assaults as "relentless." "It's hard to imagine what's left to hit," he says, adding that his team counted at least a dozen explosions per minute at one point. Israel is facing tougher than expected resistance as it makes it first small ground steps into hilltop villages across the border. Its troops sealed the town of Bint Jbail and battled for a second day Tuesday against around 200 guerrillas inside. Troops also moved on the nearby village of Yaroun, fighting guerrillas there. Fifteen Americans fled Yaroun in a convoy of 80 cars carrying residents that reached the southern port of Tyre on Tuesday. Hezbollah reported two guerrillas killed in the day's fighting, while Israel said three of its soldiers were wounded. The Israeli military said Hezbollah's commander for the central border sector, known as Abu Jafr, was killed. So far the three villages that Israeli ground troops have advanced on — Bint Jbail, Yaroun and Maroun al-Ras, which was seized by soldiers over the weekend — are in a roughly 3-square-mile pocket. Israeli bombardment has also destroyed most Hezbollah observer posts all along the border, U.N. observers say. Israel suggested that would grow — but the extent was unclear. Israeli Defense Minister Amir Peretz said Israel would maintain a security zone in the south until either a multinational force "with enforcement capability" is deployed on the border or Hezbollah is pushed back in a cease-fire agreement that also cuts off the supply of its weapons. In a pre-dawn raid, Israeli warplanes destroyed two neighboring houses in Nabatiyeh, which is 16 miles north of Bint Jbail and has been heavily bombarded in the past few days. Komati said 25 of its fighters had been killed as of Monday, and the group said two more died in ground fighting Tuesday — raising the previously announced toll of 11. Later in the day, Hezbollah, announced the deaths of two more fighters, bringing the toll to at least 27. Israel claims Hezbollah is greatly underreporting its casualties and says dozens have died. Despite estimates of the number of Hezbollah militants that Israel claims were killed and the number that Hezbollah asserts were killed, there was no way to accurately determine the number or often distinguish between civilians and fighters. Along with its daily press reports tracking major violence, the U.N. observers along the Israel-Lebanese border, known as the Blue Line, keep close track of individual incidents. Those figures, which do not include attacks far to the north, give a rare snapshot into the intensity of the violence in southern Lebanon. There were, for example, at least 73 acts of violence near the Blue Line between Israel and Lebanon on July 24 alone, including 45 air raids and artillery strikes by Israel and 12 missile launches from Hezbollah. That was in addition to numerous clashes around the town of Bint Jbail, a town known for its intense support of Hezbollah.